We have a collection of different types of Tamil Nadu Food recipes. Yes, it's clearly evident that Tamil Dishes and the different types of Tamil Nadu Food recipes are super popular not only in South India but all across our lovely country. There are some dishes like Idli, Dosa, Vada and Sambhar, which have become synonymous with Tamil Nadu’s cuisine, and every Tamilian is proud of these, but there is much more to the State’s food than just these. Tamil Nadu’s cuisine is very vast – every region has its specialties. A seasoned palate can distinctly tell the difference between foods cooked in different zones of Tamil Nadu, like Tanjore, Chettinad or Tirunelveli! However, the general taste, the courses of a meal and the foods consumed all over the State are quite similar, but for the mild but characteristic variations. What ingredients are used in Tamil Nadu Food Recipes? Tamil dishes, in general, is marked by the balanced but generous use of spices and dals. Coriander seeds, red chillies and chana dal are commonly used in most masalas, with some also including pepper, cumin, cinnamon and/or cloves. Other ingredients like coconut, ginger, green chillies, garlic and curry leaves are used in different combinations for different masalas. Raw or boiled white rice is commonly used, as are urad and toor dals. Groundnut oil, coconut oil and sesame oil are the popular cooking oils in Tamil Nadu. Tamarind pulp is used to add a tongue-tickling but pleasant tang to most curries. Likewise, most recipes also use a tempering of mustard seeds, asafoetida and curry leaves in coconut or sesame oil to give a fresh burst of flavour and aroma to the dish. Sambhar Powder and Rasam Powder are the most common spice mixes, and most kitchens have a plentiful stock of these. Each family has its favourite recipe, with their preferred level of spiciness. Most people also keep a batch of Milagai Podi handy. This is a dry chutney powder that is mixed with sesame oil and served as an accompaniment to Idlis and Dosas. It is really useful on a busy day. At breakfast time, the popular dishes are Idli, Dosa, Uttapam, Upma, Medhu Vada and Ven Pongal, served with Sambhar and Coconut Chutney. A ‘single vada’ is usually a fixed addition to the breakfast menu at most eateries and households. That is, at least one Medhu Vada is served along with breakfast whatever be the main dish! Medhu means soft, and that’s how the urad dal vada is supposed to be. A reddish golden brown, crisp outer layer gives way to a spongy, super-soft interior. The medu vada might be served plain or dunked in curd, Sambhar or Rasam. Of all the different options, the Idli, Vada, Sambhar and Chutney combo is inarguably the most popular all over Tamil Nadu. Lunch on a regular day is a simple affair. Plain hot rice is served with one or two vegetable preparations like Cabbage Poriyal, Drumstick Leaves Dry Subzi, Avial or Pongal Kootu, along with a gravy-like dish such as Mor Kuzhambu or Sambhar with some vegetable in it (like Mullangi Sambhar), plus Rasam and Curd. Every household in Tamil Nadu has a ready stock of pickles, to enjoy with the curd rice. If lunch is had out of a dabba, people often opt for what is colloquially known as ‘mixed rice’ or ‘variety rice’. Tomato Rice, Tamarind Rice, Sambhar Rice, Curd Rice and Peanut Rice are some of the common options. On special days, vada, kheer and pachadi (raita) are also served with lunch. Paal Payasam is one of the most popular and tastiest of South Indian kheers, and is a must-try! Evening tea-time is perhaps the most exciting! Even the small tea shops offer a range of snacks at that time. The snacks had with the evening tea or coffee is known as ‘tiffin’ in the South. Pakoras, Masala Vadas, Bhajiyas, Masala Dosa, etc. are enjoyed with a cup of hot South Indian Filter Coffee. With the crowd becoming more cosmopolitan in most cities, North Indian snacks like Samosas are also easily available. Bakeries are also teeming with youngsters and elders alike in the evening – coconut-stuffed buns, vegetable puffs, masaledar bread sandwiches, and soft white buns smeared with white butter and jam are hot sellers in the evening. At night, people usually have some tiffin with curd rice. Idli, Dosa, Rava Upma, Masala Dosa, Uttapam like Tomato Uttapam, Adai with Avial, Puri with Potato Masala and Chapathi with South Indian Korma are popular dinner items. Usually people go for simple accompaniments like Coriander Chutney or Tomato Chutney at night, but if they are having guests then Sambhar or Gojju is a must. 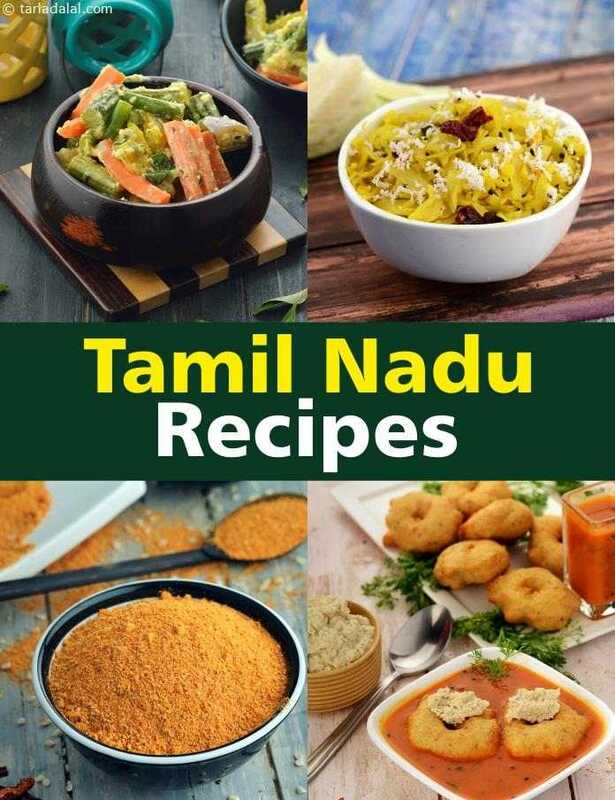 To begin with, you can start experimenting with Tamil Nadu cuisine in your own kitchen with these mouth-watering and reliable recipes. Combine them aptly to make awesome meals. Each Sunday, you can pick a different Indian state and plan your meals using the delicacies from that region – your family and you will have lots of fun travelling down the foodie highway! Enjoy our Tamil Nadu Food recipes and South Indian recipes articles below. A tried-and-tested recipe that serves as a wholesome answer to the hungry palate! a thin crisp dosa, engulfed in a spicy potato bhaji.